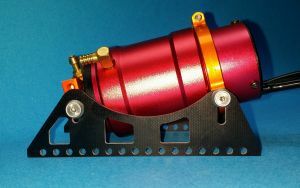 High mount fiberglass, Water cooled heavy duty motor mount for 40mm motors. This is for mounting a motor on a flat surface, for example riggers, cats and hydros. The higher fiberglass stands allow more clearence for the water jacket. Fits 40mm diameter motors that are 60mm or longer in length.Example, TP 40xx, Leopard 4074, 4082 and 4092 brushless Motors. Both water cooled and adjustable. Rear motor clamp helps carry the weight of the heavier/longer 40mm motors. Angle is adjustable to allow straight alignment with flex cable. Fits most 40mm motors that are 60mm or longer. Will fit upto a 50mm long water jacket. Total width of 58mm including the mounting stands. Metal center mounts measure 54mm wide. 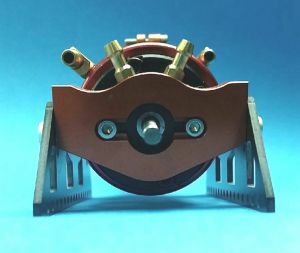 Note: This mount can also fit a vee bottom hull, but we suggest the lower ose-80600 or ose-80610 for a lower center of gravity in hulls with a vee.